You are sure to get noticed with our Atomic Barrel handbag! 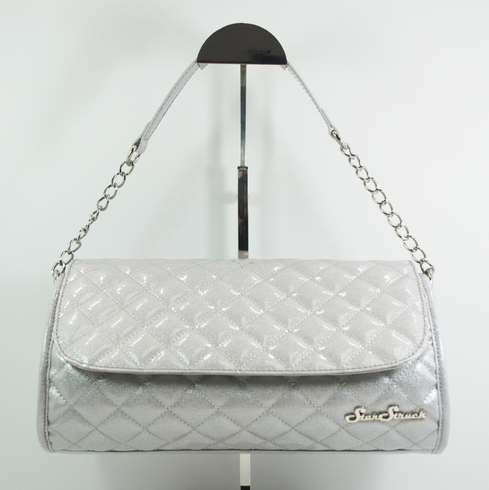 Made from Silver Sparkle vinyl it is the perfect compliment to any outfit! This handbag features our barrel bag with quilted pattern stitching, a chain link shoulder strap, a front snap closure and lined with a sturdy cotton with an interior zipper pocket. Measures 12 inches long, 5 inches tall and 5.5 inches wide. This bag also includes an extra 50 inch adjustable strap. Copyright � 2007 Star Struck Clothing All Rights Reserved.